Home > Blogs > Our Family Grows With Love > Your Son Looks Just Like You! "Your son looks just like you!" a woman said to me one Sunday as we were leaving church. It isn't often I hear that my son looks like me, though my husband and I often hear that our son, Max, adopted domestically, looks like his father. Every time, my heart swells with pride. When we first began to receive these comments, neither my husband nor I were exactly sure how to respond. Should I look at the sweet grandmotherly looking woman, who also happens to be a total stranger chatting with us in the middle of the produce section at the local grocery store, and say, “Thank you, but my son is adopted"? Should I smile and wax poetic over the striking resemblance—the round shape of their faces punctuated by their strong chins, both of which have clefts; the beautiful, ridiculously long eye lashes they are both blessed with; or the light brown color of their hair, which, if allowed to grow out, is a kind of curly any stick-straight-haired girl would kill for!—between the two main men in my life? I try and think back to when I was a little girl. Did anyone suggest to my mother that she and I, her adopted daughter, shared a resemblance? Did anyone say that I looked like my father? If so, how did my parents respond? How did their response make me feel? I can't remember now, but I knew I should ask my own mother about this. I don't really feel the need to tell a total stranger in the middle of the grocery store that my son is adopted. If I were there with a biological son and she suggested there was a resemblance, would I have felt the need to share all of the intimate details of my experience in labor and delivery? Doubtful. So responding by telling her that my son is adopted didn't feel like the right answer to me. If total strangers had suggested a resemblance between my parents and me and their reaction was to explain that I was adopted, I think that would have made me feel like any resemblance we shared by coincidence was something they were not proud of. I certainly would never want my son to feel that way! After having some time to think about these things, it's finally become rather easy for me. When the woman said that my son looks just like me, my answer was suddenly simple, as though I'd known it all along. I simply smiled at her and said, "Thank you!" I was flattered that she felt there is a resemblance between my son and me, and so a smile and a "thank you" was the perfect response in my book. After having this experience, it prompted me to ask my mom how she dealt with similar situations, and her answer should really have come as no surprise to me. She told me that she, too, would simply smile and say, "Thank you." By Gaby on Friday, June 24, 2011 at 10:19 pm. Gaby, what a great response, I love it! I do think people say that to “make us feel better” at times as well (provided they know he is adopted of course). My husband and I happen to think our son is a cutie pie, so if they want to think we gave him those good looks…who are we to disagree! By Maximilian's Mommy on Saturday, June 25, 2011 at 11:55 am. My son, who looks nothing like my husband and I, often get “where does he get that dark hair, dark eyes, long lashes…?”. I simply state “he is his own person” and smile. By outofbounds on Sunday, July 03, 2011 at 1:30 pm. I have had the same thought, actually. I think our adopted children do TRULY being to look like us on some level. I think it has a lot to do with mannerism, etc. But I do agree, that they do actually begin to look like us. It’s all the love we pour into their little lives, and they into ours. Outofbounds, I LOVE this response. It’s compltely perfect! My husband and I both have blue eyes and people will ask where his brown eyes came from..I am going to use your response. PERFECT, thank you for sharing! By Maximilian's Mommy on Sunday, July 03, 2011 at 2:01 pm. By My Lovely Daughters on Wednesday, July 06, 2011 at 3:55 am. I agree the correct reply is thank you! I tend to like thank you I think she is beautiful! By lacoleson on Thursday, July 07, 2011 at 8:46 am. THANK YOU for your article. My adopted daughter & I look very much alike. Even people who know she is adopted tell me they can’t believe she’s not my bio child. This article gave me great incite from an adoptees point of view of how to handle stranger’s comments. By rubytiara on Friday, July 08, 2011 at 8:26 pm. My Lovely Daughters, interesting scenario. Thank you for sharing your experiences, much appreciated! Lacoleson, that response is really great! I like it a lot, maybe I will work that into my response as well! Rubytiara,I am so very glad you found this article helpful. Your post brought a huge smile to my face, thank you for your comment! By Maximilian's Mommy on Monday, July 11, 2011 at 3:55 pm. 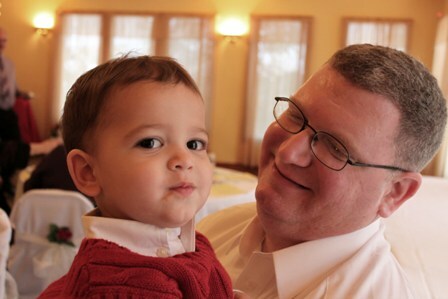 This blog is so fun for me—my adopted Grandson is from Ethiopia and or course, looks nothing like my caucasion daughter, or my blond, blue-eyed son-in-law. But, with only 7 or 8 months as a family, it is truly weird, how much he is like my daughter and husband, totally artistic as they both are, and showing the patience of my husband, who is a carpenter. It just goes to show you, that the things you think are “inherited” are actually just part of people’s interests! By New Grandma on Friday, February 10, 2012 at 8:06 am. There are a lot better reponses here than I have ever thought of saying. I truly never thought anybody would say “oh, he looks just like you”. My son is Mexican and I am very white (I have on occasion got the comment “are you feeling well because you look so pale”). So I actually laughed right in a poor woman’s face who said he looked just like my but slightly darker. I was at a total loss for words. By RRB on Saturday, February 11, 2012 at 7:22 am.